NEW LONDON, N.C. (Seminoles.com) – Junior Bennett Baker fired an opening-round 68 to lead the fifth-place Florida State Men’s Golf team through the first round of the ACC Championship held on Friday at Old North State Club in New London, N.C.
Baker, a Tallahassee native from Chiles High School, delivered along with the other upperclassmen for the Seminoles. Junior Corey Carlson, who has been out for most of the year with an injury, recorded a 2-under 70 (T18) while redshirt senior Harry Ellis was the other Seminole under par at 1-under (T23). “Today is another example that we are moving in the right direction,” FSU head coach Trey Jones said. “Corey was first off for us and was never over par. Bennett has a great mindset for competitive golf – he enjoys the moment and isn’t going to back down. Opening with a 68 will validate his progression. Baker was coming off his second-best finish of the year when he tied for sixth at the Gary Koch Invitational. He picked up where he left off on Friday, currently tied for ninth in the field after delivering a team-high six birdies. Two of his six birdies came on par 3 holes, and his only error in the opening round was his double bogey on the par-3, 197-yard 17th hole. For Baker, his 4-under 68 is his lowest opening-round score vs. par this year. Carlson’s performance was just as impressive, getting Florida State started with two birdies on the front nine, followed by two more on the back. The Green Cove Springs, Fla., native was consistent on both the front and back nine, shooting a pair of 35s. Ellis endured a tough stretch on the front nine where he bogeyed three of his first six holes. However, the defending Amateur Champion carded a 33 on the back nine, courtesy of four big birdies to end his round on a high note and become the third Seminole under par. Sophomore Jamie Li and freshman John Pak are each tied for 31st at 1-over, and are capable of leading the way for the Seminoles in Saturday’s second round. 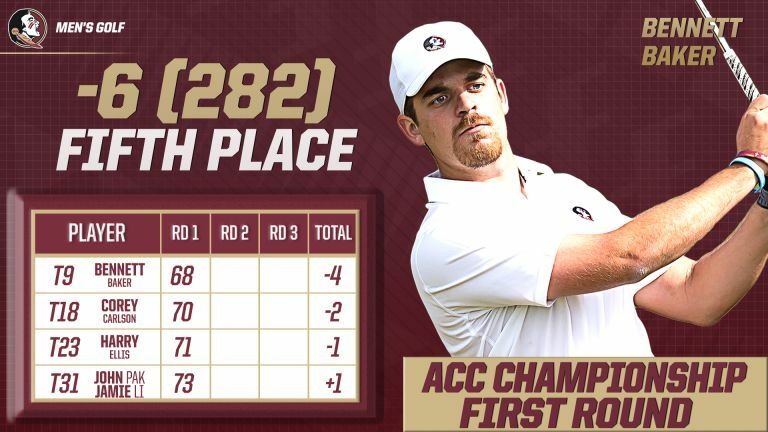 FSU is only six strokes behind first-round leader Georgia Tech (-12). Notre Dame (-11) is just one off in second place, followed by Clemson (-9), Wake Forest (-7) and FSU (-6). Nine of the 12 ACC teams in the field shot under par for the day. Florida State’s 22 cumulative birdies is the most of any team so far. Saturday’s pairings include Li teeing off first at 9 a.m., followed by Pak (9:12), Ellis (9:24), Carlson (9:36) and Baker (9:48).